Let's start simple. Side dishes. These are going to be the easiest thing to prep ahead of time, and the most "normal" for you to make. You've probably made a lot of them before, even if you've never roasted a full turkey. You can make crock pots and guests work for you when it comes to sides, something I highly recommend. If someone wants to bring something, let them! It will give them something to do on the day of (there's nothing sadder to me than a bored kitchen on turkey day!) or something to focus on. I think it makes people feel involved. So if people ask, I think giving them simple staples like mac and cheese, mashed potatoes, bread, or veggies is a great way to go. That way if you're passionate (or slightly control freaky!) about which recipes are used for main dishes, you can take care of that yourself. I'll also say that if you aren't super comfortable with freezer cooking, now would be a great time to change that. When I first began researching methods that seemed to work for Thanksgiving, I saw that many were making things ahead of time and freezing individual elements of or all of their recipes, for time's sake. This made me uncomfortable at first but I promise embracing it will be totally worth it! 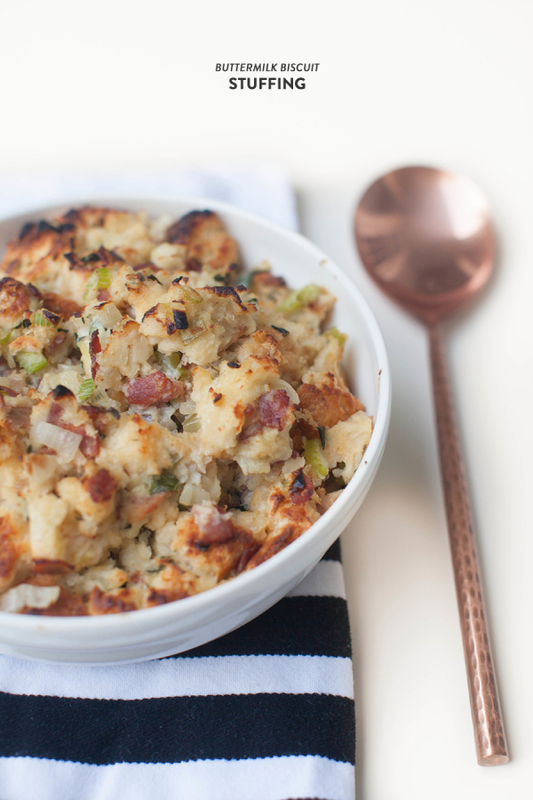 As a Thanksgiving purist, stuffing is a non negotiable for me. And looking at this recipe is a great example of how to get your head in the game for Thanksgiving. Look at the prep time? 24 hours. You need to make your cornbread and leave out your chunks, along with your other bread chunks to let them dry out before making the actual dish. If you didn't notice this ahead of time and tried to make it on Thanksgiving morning.. it could't happen. I made this dish our first Thanksgiving and it was a huge hit. I believe I'll be returning to it this year. This would be a great recipe to make all of ahead of time, freeze, thaw the day before, and bake morning of. As I said before, the freezer is your friend. In 2013, I had planned to make this dish twice in one week, but didn't use more than a fourth of it the first time. I froze it that Sunday night (completely cooked and had been eaten out of) and Thursday morning I defrosted and warmed in the oven. No one was the wiser. Either method would work great for freezing. 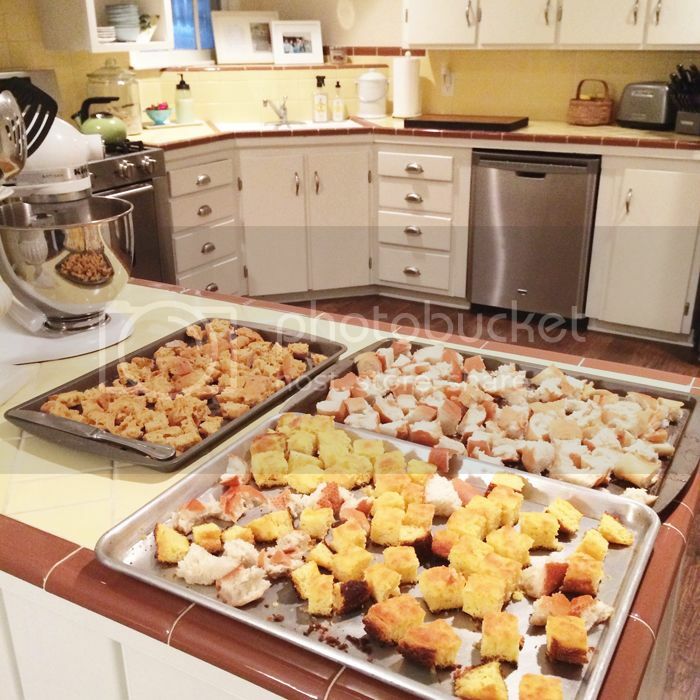 Cut all the bread into 1-inch cubes and lay them out on sheet pans. Cover with a dish towel and let them dry out for 24-48 hours until they're dry and crisp. Put all the bread cubes in a large bowl and slowly ladle in the broth mixture, tossing as you go until the dressing has the moisture level you want. Taste and add more seasonings as needed. Pour the dressing into a large casserole pan and/or the turkey cavity. Bake the casserole for 20 to 30 minutes at 375 degrees until golden and crisp on top. Serve piping hot with a turkey and gravy! In a skillet or the microwave, cook bacon until crisp. Set aside on paper towel lined plate. Remove most of the bacon grease, keeping about 1T in the pan. Saute shallots and celery with salt and pepper in pan, until shallots become opaque, about 5 minutes. Add herbs, cook for about 1 minute. Cut bacon into bite size pieces. Break biscuits into large chunks, about 1-2"
Combine biscuits, bacon and herb/vegetable mixture in a large bowl. In a small bowl, combine the chicken stock. Fold in the liquid mixture. In the same small bowl combine the rest of the stock and the eggs and stir until eggs are incorporated. Pour over your biscuit mixture. Use a fork to allow the mixture to seep thru. Cover with foil. Bake on the middle rack for 35 minutes. Remove foil and bake an additional 15 minutes on the top rack until browned and crisp. This recipe is my classic go to. It's easy and yummy and an old faithful that I don't have to worry about. 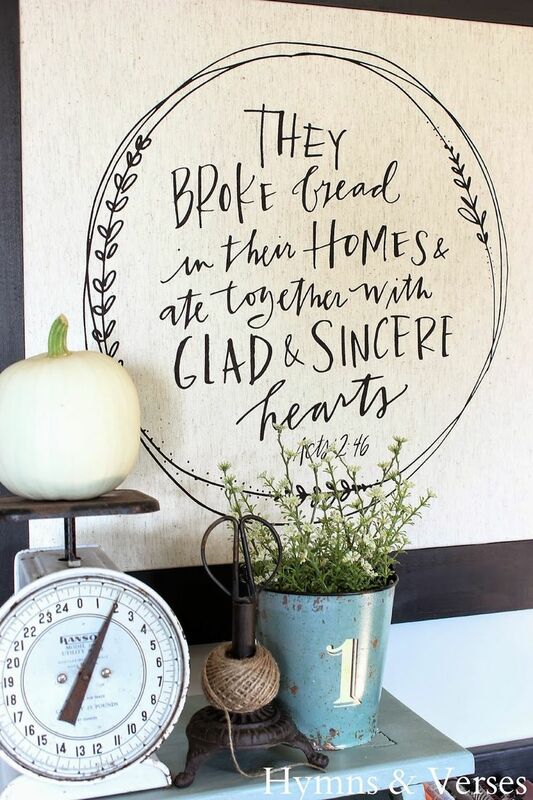 When we first got married I'd often make it for guests. Now, it's a rarity as I try to keep the buttery, cream cheesy goodness at bay, but it's Thanksgiving! I will note that I don't think it's a terrible idea to give yourself 30 minutes extra on a high profile day like thanksgiving in case your potatoes aren't cooking quite as quickly as normal. Crock pots are also great because you can stick them anywhere.. clearing up some high profile Thanksgiving day counter space. I often forget that I'm making these and love just being able to grab my masher and my creamy ingredients and make the recipe come together in just a few minutes. Place diced potatoes in the slow cooker. Add garlic, onion, salt and pepper to taste, and water. Mix to coat. Cover and cook on high for 3-4 hours, or until potatoes are tender. Remove lid and mash potatoes to desired consistency. Stir in cream cheese, butter, and add the milk or cream to your liking. Serve right away, or switch your slow cooker to warm. It wouldn't be Thanksgiving without gravy, right? For some reason this staple was really intimidating to me but this great make ahead recipe made it easy and approachable. This year's issue of Southern Living suggests making this a month ahead... I'll probably make it just a few days before when making pies or something. 1. Melt butter in a Dutch oven over medium heat; whisk in flour, and cook, whisking constantly, 3 to 4 minutes or until mixture is light brown and smooth. Slowly whisk in 4 cups stock. Increase heat to high; bring to a boil, whisking occasionally. Reduce heat to medium; stir in sage and next 4 ingredients. Simmer, stirring occasionally, 10 to 15 minutes or until desired thickness. 2. To make ahead, cool gravy completely. Cover and chill up to 3 days. Cook gravy and, if desired, 5 to 6 Tbsp. stock in a Dutch oven over medium-low heat, stirring occasionally, 15 to 20 minutes or until hot. Mushroom Gravy: Heat 1 1/2 Tbsp. olive oil in a medium skillet over medium-high heat. Add 1 (8-oz.) package sliced cremini mushrooms; sauté 6 minutes or until tender and browned. Stir in 1 Tbsp. butter and 1 Tbsp. minced shallot; sauté 2 minutes. Add salt and ground black pepper to taste. Prepare recipe as directed through Step 1 or 2. Add mushrooms. Cook over medium heat, stirring occasionally, 5 minutes. Hands-on 35 min., Total 45 min. Fresh Herb Gravy: Prepare recipe as directed through Step 1 or 2. Stir in 1 Tbsp. chopped fresh flat-leaf parsley, 1 tsp. thinly sliced fresh chives, 1/2 tsp. chopped fresh tarragon, and 1/2 tsp. fresh lemon juice. Cook over medium heat, stirring occasionally, 5 minutes. Hands-on 25 min., Total 35 min. Sherry Gravy: Prepare recipe as directed through Step 1 or 2. Remove pan from heat; stir in 1/4 cup sherry, bourbon, or brandy. Return to medium heat. Cook, stirring occasionally, 5 minutes. Note: Poor cooled gravy into quart sized zip top plastic freezer bags; seal and lay plays flat on a baking sheet. Place in freezer. Once frozen, the bags are easily stackable. Thaw three to four days in the fridge before reheating on the stovetop. My one issue with planning for sizes is always a lack of actual vegetables. Sigh. It's like when you order a veggie plate and none of the sides you choose are veggies.. am I right? But it's become important to me to sneak a little bit of real green into the mouths of my guests. We tried this great recipe from (of course) Southern Living last year, and it was great. I'll probably try something different this year. 1. Preheat oven to 375°. Cook kale in 1 cup boiling salted water in a Dutch oven over high heat, stirring occasionally, 5 minutes; drain. 2. Cook onion in hot oil in a large skillet over medium-low heat, stirring often, 20 minutes or until golden. Add garlic, thyme, and nutmeg, and cook 1 minute. Stir in flour and cooked kale. Gradually stir in milk and broth, and cook, stirring often, 4 minutes or until thickened. Stir in rice, tomatoes, and 1/2 cup cheese. Add salt and pepper to taste. 3. Transfer mixture to a lightly greased (with cooking spray) 2 1/2-qt. baking dish. Sprinkle almonds and remaining 1/2 cup cheese over mixture. 4. Bake at 375° for 18 minutes or until bubbly and lightly browned. As I mentioned above, sides are prime candidates for make ahead and freeze. Love you, sides, for being low maintenance. And again, don't forget your crock pot! 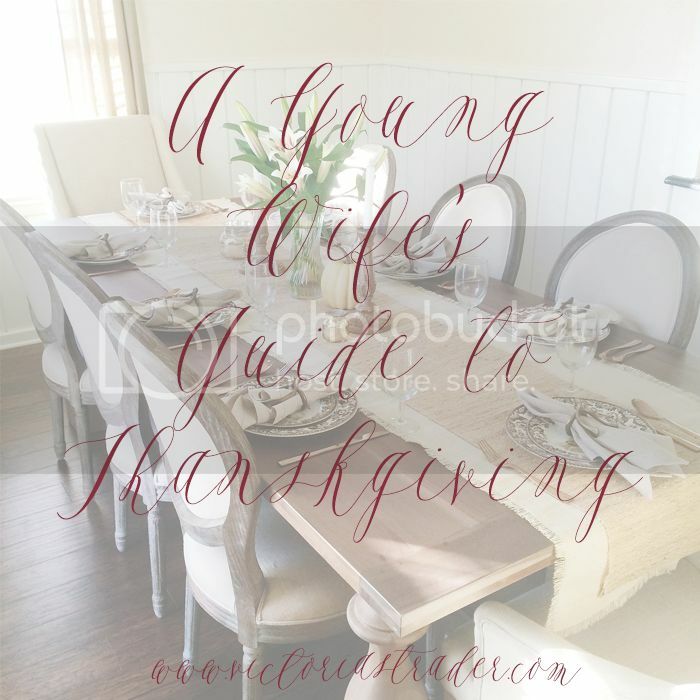 The post I'm thinking will serve any first time turkey day hosts the best will go live next Monday- my ultimate Thanksgiving prep timeline, 2015 menu, and 2015 shopping list. YAY! Can't wait!! I'm already excited to come back to that post next year and be like, okay this is easy peasy! Ha! I'm going to try the PW's dressing recipe! It looks so good and so doable! My mom makes the best Sweet Potato Casserole because it's so sweet :) It's a must! Oh, and she makes awesome deviled eggs, too!